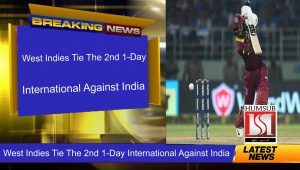 West-Indies Tie The 2nd 1-Day International Against India: Centurion Shai Hope hit a last-ball boundary to help West Indies tie the second one-day international against India despite Indian skipper Virat Kohli s dazzling 157 on Wednesday. Needing five runs on the final ball to chase down West Indies target of 322, Hope — who made a total of 123 — got four off Indian paceman Umesh Yadav as the tourists ended on 321-7 in their 50 overs. The left-handed Hetmyer, who came into the match on the back of his 106 in the West Indies opening loss, smashed four fours and seven sixes to unsettle the Indian bowlers. Hetmyer though fell short of what would have been his fourth ODI ton after top edging one of Yuzvendra Chahal s leg spinners to get caught by Kohli at cover. Hope, who registered his second ODI ton, kept chipping away despite some tight bowling by the Indian pacemen and Holder s run out. “The way (the) two teams played it was a fair result,” Kohli added. Kohli s fresh heroics came at the back of his 140 in India s opening win on Sunday. He has also notched up 1,000 ODI runs in just 11 matches this year.